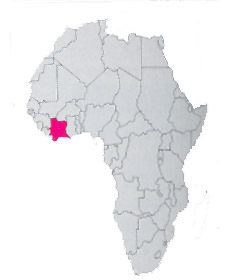 It is a state of western Africa that overlooks the Atlantic ocean on the Gulf of Guinea, with low coasts hemmed of lagoons. As many African states it has an uncertain political position with consequent climate of violence. It is great few more than Italy, but it has just 15 million inhabitants; despite this in the last 40 years the population is more than quadrupled, mainly for the strong immigration from Burkina Faso, from Ghana and from Mali. The principal city is Abidjan with over 2 million and half of inhabitants, that has been replaced in the role of capital by Yamoussoukro, a city of the inside plateau.